Stillness of the Mind Awakens the Heart and Soul. Path of liberation from suffering. Release pain, sorrow, addictions. Stillness of the Mind brings awareness that expands ability to see without distraction. Brings confidence and strength to live with full consciousness. Your physical, mental and emotional experiences change. In reality, to be liberated from suffering of root of fears and pain, we need new feelings and thoughts. To put new feelings and ideas into action to create new reality. You want to go beyond dreams, concepts and to bring new reality into your life. But all therapist and coaches to date have been incapable of helping you make your dreams a reality. To dream a new dream into life with amazing people around you who support you. We need people with new minds to create new realities. It takes strength and courage to move from the current reality you want to change. Going beyond conditioned feelings reactions, perceptions thoughts and established consciousness needs powerful influences. If you don’t do beyond these sufferings and challenges in this lifetime you’ll be born again to suffer through same despair, sorrow and pain in next lifetime. When you see the truth, there is no division. Holistic perception frees the programmed mind completely. You want to never be born again into these levels of sufferings and control. When the gross part of your frustrations, jealousy, envy, lust, sexual frustration, physical pain vanish; mental confusion subsides. New life begins instantly. You no longer live in duality that brings about conflict in life. Free all Ignorance & Inner Conflict through Stillness of the Mind. 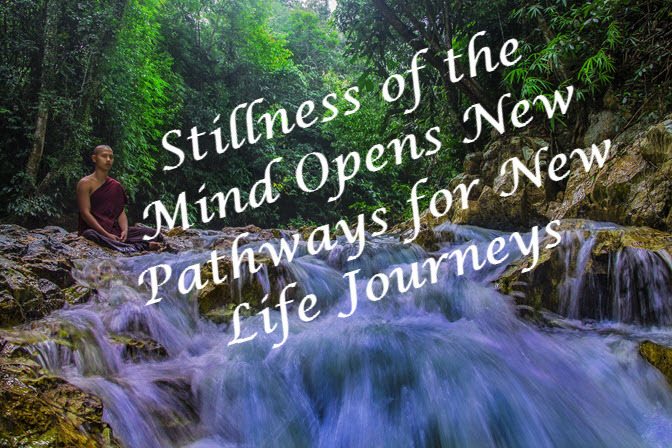 In the Stillness of the Mind we become aware of the subtle influences that perpetuate suffering in life. These are experienced simultaneously. Not analysing endlessly and getting caught up in the journey of releasing pain. If you do that you accumulate more lifetimes of suffering. Together we walk the walk of compassion, joy, compassion, cooperation and collaboration. These elements are the tools that liberate you from suffering. Together we create your new life. Together we do what you do not know what to do and how to do. Together we walk the Path of liberation from pain, sorrow, addictions. Now live the reality of your creation. If we analyze past pain, we are not bringing new meaning to your life. If we analyze we are using energy on the past. What we need is new energy to build new pathways of building your new you. Go beyond pursuit of pleasures that never satisfy beyond that moment. When we focus on sensual pleasure, if your are really honest with yourself you frustration often follows. Frustration is result of ending of that pleasure. And there is an emptiness your seek to fill again. When you reach Stillness of the Mind observation is clear and able to take action. The inability to take action beyond ingrained patterns disappear. Time and thought are root of fear. Stillness of the Mind stops time and thought. Clarity of seeing exactly what to do and how to do that becomes actual truth in your life. Contact us to let go of suffering and begin your new life. This is not theory or teaching. This is reality that many clients share throughout this site within the videos. This entry was posted in Vibrational Healing and tagged Heal relationship communication, Healing trauma, higher consciousness, Massage for Women, sexual healer, spirit energy, subtle influences on 13/02/2018 by Tasha.